It is the penultimate day of April, and I have completed submissions for one remaining poet, set for tomorrow. But what about today? Every year, I reach out to dozens and dozens of poets, and I have never struggled as mightily as this year to assemble our lineup. Every year, there are always a handful of rollovers for next year (or the year after), but I generally have spilled over into May. This year, there was a hole at the end of the month, so I've decided to selfishly fill it. 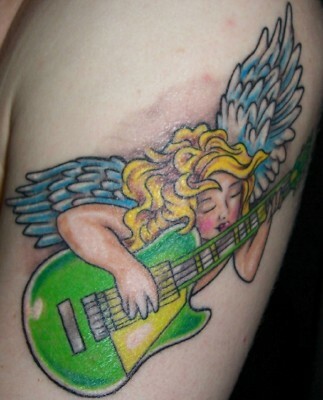 So, dear readers, today's tattooed poet is a returning contributor, William Dickenson Cohen, who first contributed in 2009 here. This is a customized version of a Maneki-neko cat. Most folks may recognize the basic image from Asian-owned businesses, who have these cats, with waving paws, in their storefronts. 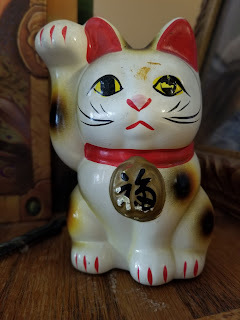 The cat is meant to bring success and good fortune and, growing up in Hawai'i, they were everywhere. 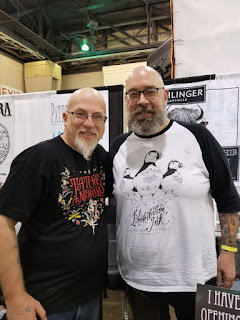 So, when I knew I was going to Philly, and learned that artist JJ Ohlinger from Prohibition Ink was working the show, I discussed the possibility of getting work from him when I was there. 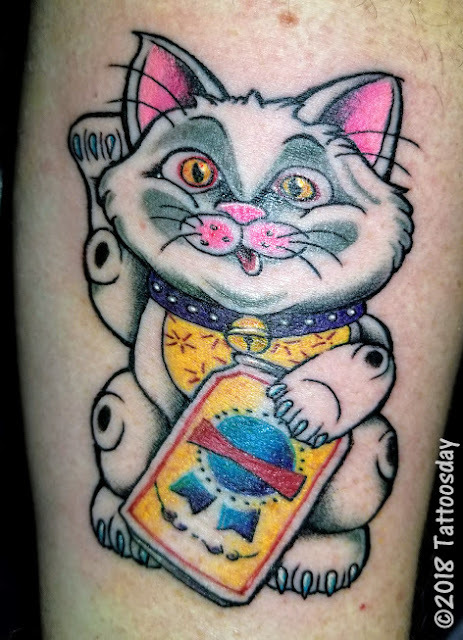 I told him I had wanted a Maneki-neko, and gave him free reign to come up with a design. He drew up two, changing the piece that features kanji to resemble a Pabst Blue Ribbon can. He said he looked through my Facebook feed and mostly saw posts relating to politics and beer, and he didn't think he could work our president into the cat design. At the Philadelphia convention, the stars aligned and JJ was able to fit me in. The result is a quirky, colorful Maneki-neko which I hope will bring good fortune and future success to me and my family. 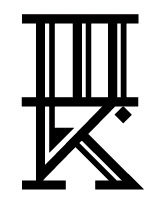 Back in 2009, when I snuck my own tattoo and poem into the first year of the Tattooed Poets Project, I diligently worked on a tattoo-related sestina, which I was thinking would be appropriate to re-share. I recently read it in public for the first time, and it was well-received. I decided against re-posting it but, if you're interested, you can find it here. Like fading stains on the sidewalk. I hum along to the needle’s song. Please return tomorrow for our final post of the 2018 Tattooed Poets Project, and thank you for allowing me to share my newest tattoo and poem here on Tattoosday! hi, i'm a tattooed poet living in northern california, and i am a big fan of your annual tattooed poets feature. i look forward to it every year. thank you for your energy, time and enthusiasm for both tattoos, and especially poetry. keep up the great work, please. if you have another hole to fill in your tattooed poets line up i'm very happy to recommend the names of a few tattooed poets that i know and love. please keep up your very good work. i look forward to seeing who you have in store for us next year.